On the prowl in the outback. Cats kill more than a million birds every day across Australia, according to our new estimate – the first robust attempt to quantify the problem on a nationwide scale. By combining data on the cat population, hunting rates and spatial distribution, we calculate that they kill 377 million birds a year. Rates are highest in Australia’s dry interior, suggesting that feral cats pose a serious and largely unseen threat to native bird species. Undoubtedly, if many of our highly interesting and beautiful birds, especially ground-loving species, are to be preserved from total extinction, we must as a bird-lovers’ union, at no distant date face squarely a wildcat destruction scheme. His call produced little response, and there has been no successful and enduring reduction in cat numbers since. Nor, until now, has there been a concerted effort to find out exactly how many birds are being killed by cats. 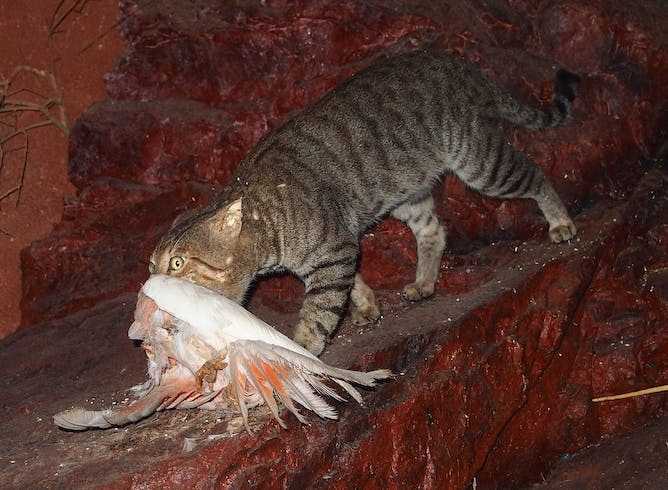 To provide a first national assessment of the toll taken by cats on Australian birds, we have compiled almost 100 studies detailing the diets of Australia’s feral cats. The results show that the average feral cat eats about two birds every five days. 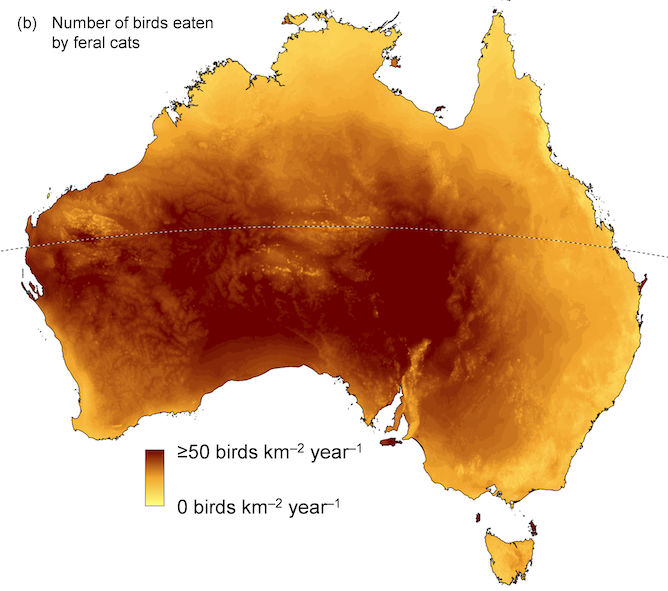 We then combined these statistics with information about the population density of feral cats, to create a map of the estimated rates of birds killed by cats throughout Australia. Number of birds eaten per square kilometre. We conclude that, on average, feral cats in Australia’s largely natural landscapes kill 272 million birds per year. Bird-kill rates are highest in arid Australia (up to 330 birds per square km per year) and on islands, where rates can vary greatly depending on size. We also estimate (albeit with fewer data) that feral cats in human-modified landscapes, such as the areas surrounding cities, kill a further 44 million birds each year. Pet cats, meanwhile, kill about 61 million birds per year. Overall, this amounts to more than 377 million birds killed by cats per year in Australia – more than a million every day. In a related study, we also compiled records of the bird species being killed by cats in Australia. We found records of cats killing more than 330 native bird species – about half of all Australia’s resident bird species. In natural and remote landscapes, 99% of the cat-killed birds are native species. Our results also show that cats are known to kill 71 of Australia’s 117 threatened bird species. Birds that feed or nest on the ground, live on islands, and are medium-sized (60-300g) are most likely to be killed by cats. Galahs are among the many native species being killed by feral cats. suggesting that cats kill about 3-4% of Australia’s birds each year. However, particular species are hit much harder than others, and the population viability of some species (such as quail-thrushes, button-quails and ground-feeding pigeons and doves) is likely to be especially threatened. Our tally of bird deaths is comparable to similar estimates for other countries. Our figure is lower than a recent estimate for the United States, and slightly higher than in Canada. Overall, bird killings by cats seem to greatly outnumber those caused by humans. In Australia, cats are likely to significantly increase the extinction risk faced by some bird species. In many locations, birds face a range of interacting threats, with cat abundance and hunting success shown to increase in fragmented bushland, in areas with high stocking rates, and in places with poorly managed fire regimes, so cat impacts compound these other threats. What can be done to reduce the impact? 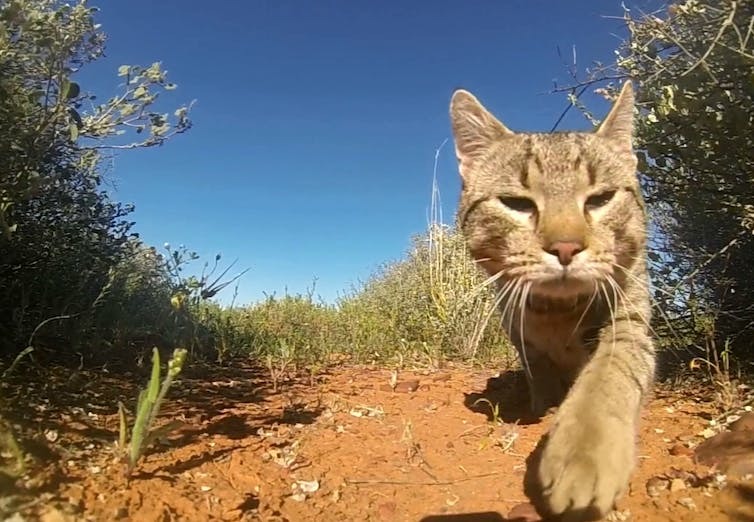 The federal government’s Threatened Species Strategy recognises the threat posed by feral cats, albeit mainly on the basis of their role in mammal extinctions. The threatened species strategy also prioritised efforts to control feral cats more intensively, eradicate them from islands with important biodiversity values, and to expand a national network of fenced areas that excludes feral cats and foxes. But while fences can create important havens for many threatened mammals, they are much less effective for protecting birds. To save birds, cats will need to be controlled on a much broader scale. We should also remember that this is not just a remote bush problem. Roughly half of Australia’s cats are pets, and they also take a considerable toll on wildlife. While recognising the many benefits of pet ownership, we should also work to reduce the detrimental impacts. Fortunately, there is increasing public awareness of the benefits of not letting pet cats roam freely. With such measures, cat owners can help to look after the birds in their own backyards, and hence contribute to conserving Australia’s unique wildlife. We acknowledge the contribution of Russell Palmer (WA Department of Biodiversity Conservation and Attractions), Chris Dickman (University of Sydney), David Paton (University of Adelaide), Alex Nankivell (Nature Foundation SA Inc.), Mike Lawes (University of KwaZulu-Natal), and Glenn Edwards (Department of Environment and Natural Resources) to this article. Australia is so famous for its dangerous creatures that visitors often arrive fearful that everything that moves is out to get them. In a land where snakes, spiders, shells and even one of the iconic mammals – the platypus – can bite or sting, should we all be worried about plants as well? Plants around the world produce a staggering diversity of chemicals and many of these are potentially toxic to animals including humans, sometimes even upon contact. Many of these toxins have evolved to protect plant roots, leaves and unripe fruits from being eaten by herbivores, particularly insects and browsing mammals. Australia’s toxic plants are not terribly appealing or nutritious for humans. If someone is poisoned, it’s usually accidental, and many victims are curious children. There are many historical records of plant poisoning in Australia involving early explorers and settlers who were short of supplies or looking for new sources of food. Today, though, plant poisoning accounts for less than 1% of calls to poisons information lines in Australia. The threat of poisoning to livestock is much more substantial and causes significant economic and animal welfare impacts. It’s in the interests of cattle and sheep to become expert botanists, but even experts can get things wrong when confronted with something they’ve never seen before. Most livestock poisonings occur when animals are moving through new country or are put into new paddocks with unfamiliar plants. Native plants that kill significant numbers of livestock include Cooktown ironwood in northern Australia (as little as 50 grams of leaf can contain a quantity of alkaloids that can kill a bull) and the poison peas and heart-leafed poison bush of Western Australia and Queensland respectively (Gastrolobium), which contain a deadly metabolic poison, sodium fluoroacetate. Elsewhere, introduced pasture weeds such as fireweed, Senecio madagasciarensis, and Paterson’s curse, Echium plantagenium, pose significant threats to cattle, sheep and horses. The adage that “the poison is in the dose” is correct in that small amounts of most poisonous plants are unlikely to cause permanent damage or death, although there are exceptions. Indeed, most herbivores have to tolerate some exposure to plant poisons because they’re so widespread among the plants they eat. Small amounts of some toxic compounds can even be beneficial and sometimes have traditional or medical uses. Aboriginal people, for instance, used Duboisia hopwoodii and other native tobacco species (Nicotiana) to produce a powerful and widely traded stimulant, pituri, the active ingredient of which is the potent alkaloid, nicotine. Similarly, atropine, an alkaloid found in Angels’ trumpets and thorn-apple (Brugmansia and Datura species) is a powerful hallucinogen and toxin. But it’s also a valuable drug used to treat some heart and nervous conditions, as well as poisoning by some other plant alkaloids and cardiac glycosides. Knowing what dose of poison a plant contains is not always easy. How much toxin an individual plant contains can vary with season, the age of the plant, soil type, drought and the plant’s genes. Just as you may be tall and your next-door neighbour short, two plants of the same species growing alongside can vary in how much toxin they produce. On top of that, different animal species and individual people and animals can also vary in their ability to tolerate poisons. This makes ingesting toxic plants a little like Russian roulette: there’s a strong element of chance. A significant number of Australia’s more than 20,000 plants are potentially toxic. In many cases, Australia has species or subspecies of plants that are closely related to well-known toxic plants from elsewhere. But their relative toxicity is not well established. The Indian suicide tree, Cerbera odollum, has been described as the “perfect murder weapon”, for instance, but the toxicity of our native Cerbera manghas is less well understood, despite the fact it possesses the same cardiac poisons. Similarly, how our native strychnine bushes Strychnos lucida and S. psilosperma compare to the better-known strychnine tree S. nux-vomica from India is not well known, but they do also produce strychnine. Unless you’re a hungry ruminant, you’re probably unlikely to suffer death by plant poisoning in Australia, but the risk is nonetheless real. It pays to realise that garden plants and even common indoor plants are sometimes just as dangerous as what lurks in the bush. Parents and outdoorsy types should be aware of the risks posed by contact with or ingestion of plants. The article below reports on the large number of Rhinos lost to poaching this year in South Africa.